"I always tell them that all these things were possible because we came together as women. There is nothing more powerful than that." 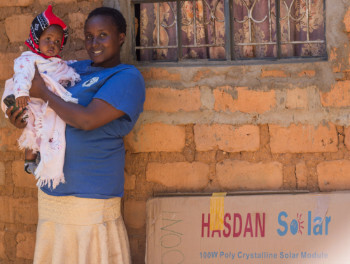 Jackline recalls, pictured here with her youngest daughter as she receives her solar pack. Jackline is a member of Kyeni Kya Yatwa Women Group. She got married at the age of 20 and her mother-in-law enrolled her in a women’s group. 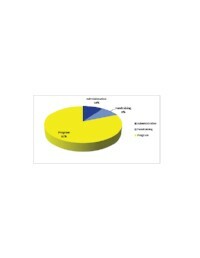 Through the group’s savings and PFP matching their savings every member of the group has been able to own a water tank. Owning a water tank for Jackline essentially has freed herself from walking long distances in search of water and she now has time to concentrate on her roadside kiosk where she sells foodstuffs (bread, milk, sugar, honey, cereals, and vegetables) thus economically empowering herself and her family. Due to lack of power, Jackline had to close the kiosk very early to avoid being attacked or robbed. “This had been extremely challenging for me because most families like buying food stuffs in the evening after they get off work. By closing early, it meant I did not sell much. My life took a U-turn when we decided in our women’s group that we would start saving for solar panels. We made our savings and PFP matched them and before long the PFP sisters from Seattle visited my kiosk and brought me a solar panel,” Jackline narrates.